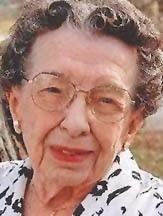 WATERLOO - Florence E. Bowen, 93, of Cresco, formerly of Waterloo and Lime Springs, died Sunday, Dec. 11, at Evans Memorial Home, Cresco, of natural causes. She was born Jan. 29, 1918, in Fillmore County, Minn., daughter of Emerson and Mary Kingery Broadwater. She married Glenn A. Bowen on May 2, 1948. He died July 6, 1994. Mrs. Bowen was a homemaker and a member of Walnut Ridge Baptist Church. Survived by two sons, Paul (Vicki) of Lime Springs and Mark (Pamela) of Rolla, Mo. ; two daughters, Eloise (Larry) Black of Cedar Rapids and Mary (Dan Brady) Jacobson of Melbourne; 10 grandchildren, Kevin (Kindra) Black of Council Bluffs, Renee Black and Deborah Black, both of Cedar Rapids, Matthew (Melissa Klug) Bowen of Preston, Minn., Daniel Bowen, Christopher (Beth) Bowen and Holly (Eric) Munkel, all of Lime Springs, Lindsey (Rishi) Vajpeyi of Minneapolis, Derek (Megan) Jacobson of Ankeny and Elizabeth (Brandon Vader) Jacobson of Des Moines; and eight great-grandchildren. Preceded in death by her parents; two sisters, Ethel Kiehne and Marvel Underbakke; and two brothers, Raymond and Elvin Broadwater. Services: 11 a.m. Friday at Walnut Ridge Baptist Church, with burial in Garden of Memories Cemetery. Visitation from 5 to 8 p.m. Thursday at Parrott & Wood Chapel of Memories, an Overton Family Service, Waterloo. Memorials may be directed to the mission fund at Walnut Ridge Baptist Church. Florence cared for her family by cooking, sewing, gardening and canning. To Florence, family was her life. She was a faithful attendee at various family reunions and instilled in her children the importance of family.